I mentioned in it that I hate cooking, I mean really hate cooking, unless of course it’s cooking meat with fire, outside. I’ve discovered something else. I really hate shopping for ingredients for a meal. I only really discovered this the other day when I foolishly volunteered to buy the stuff that my wife was going to throw together to feed some friends. We have a lovely friend who lives in the States, hopefully temporarily. Sooz pops across the pond from time to time to see her family and friends and when she is in country she will often pop to the country to visit us, great! 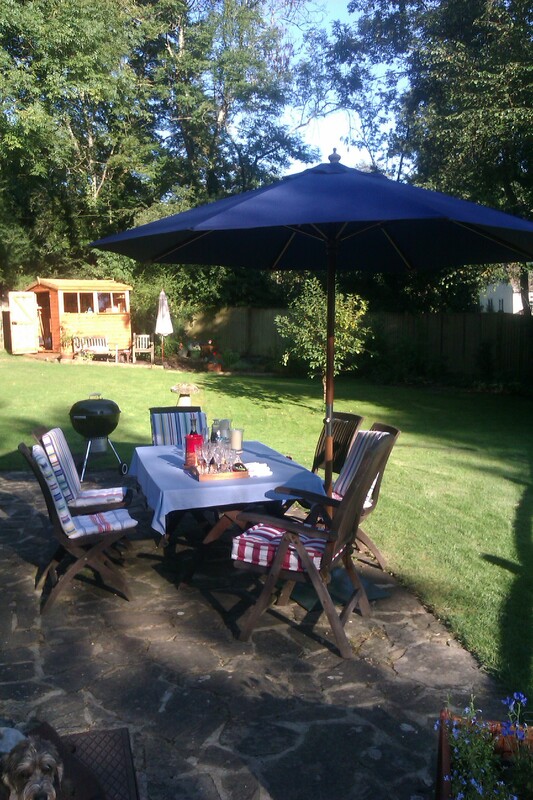 We decided that it would be nice to invite a couple of other friends round to have a little summer supper session in the garden with Sooz, so Pete and Vero were called and accepted, lovely. They were all told it would be very informal, just us, come casual was the order of the day. At some stage during the week though my wife, Jenny, decided what might be nice would be if she attempted an 8 course meal, only one course of which she has cooked before and 3 courses which come from Le Gavroche cookbook. How amazing is that? Come Friday Jen had to go to London so I said I would whip to Waitrose to get the bits required, no problem! Jen handed me a number of pieces of paper and waved me off while she went to catch the train. I’m sure I heard her giggling as she skipped into the station. So, I needed some Scallops, easy enough. The list also said 1 kilo of vine tomatoes. Why a weight and not a number? Look at all the kinds of vine tomatoes, which one? I texted her to ask, she replied it didn’t matter, how can it not matter? Some are little and some are big, some are organic and some are not. They are all for different things! I grabbed a bag and got a kilo of little ones. The list also said tapenade, do you know where they keep tapenade in Waitrose? Me neither! It seems it is at toddler knee level with some pasta sauces and it comes in at least three flavours! So I texted her to ask which accompaniment to olives she would like in the particular tapenade she was after. Coriander, great! The main event of the meal was to be my favourite thing to eat in the evening. Jamie Oliver’s Asian squash salad with crispy duck. You need a whole 2kg Gressingham duck to make it with. It seems no-one wants whole ducks any more though, they want duck breasts, duck legs, duck crowns, you can even get duck sausages now. Just not what I wanted, which was a whole duck. I went to another supermarket, much larger. I parked, paid. I got a trolley and made my way among the mums to the meat counter. “Do you have a duck?” I asked, expecting the answer no, “Not much call for it” I was told. “I’ve called for it” I lamented, he shook his head sympathetically but also probably wondering what sort of fool wants a whole duck this far from Christmas. I drove to the butcher, parked and paid, prepared to pay even more handsomely for a duck from a butcher. “Do you have a duck” I asked. “Not much call for it” I was told, I slouched out in a huff. Back in the Land Rover to head across the county to the butcher who has everything. “Do you have any duck?” “Not this time of year”. Seriously!? I texted Jenny that there were no ducks and should I get a duck crown or two? She replied with ‘no’ I have no idea what to do. I have a car full of things to eat but not the main event. I consulted the internet and discovered a butcher in a far corner of the county who could produce anything the next day. I was tempted to ask for Hippopotamus, I probably had more chance of getting one. Success, he could get me a duck! “Come in tomorrow morning” he said. Triumph! I had to go to Guildford the next day anyway as my car windscreen needed replacing and as a side note had a strangely distressing experience. I had stupidly arranged to have my windscreen fixed while the All Blacks were playing Australia! I took the iPad with me with my newly installed Sky Sports app so I could spend my time in the workshop waiting room watching the footy, cunning plan! 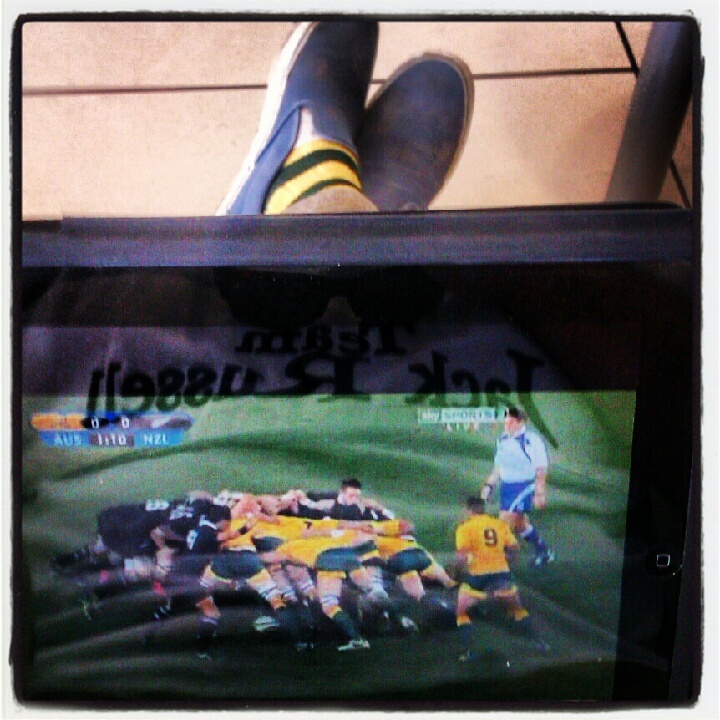 There was a small handful of other people in the waiting room who could hear and see me watching a game of rugby between New Zealand and Australia, then I looked down past the iPad to my feet. A teenager would call that an Epic Fail. I am a very patriotic Kiwi watching my men in black playing the other blokes in Green and Gold. Shocking sock choice for the day for a kiwi, god forbid they would think I was an Australian! That aside I drove to the butcher who had everything including my duck and all was right with the world. It had only taken me a combined total of almost a whole day to put together the stuff to be made into a feast for our friends. When I do the buying for the BBQ thing I reckon the meat is sorted in under a minute. Want to know what the feast consisted of? Course 8) Strawberries dipped in chocolate with coffee to finish. Now I really am ready for my holiday. Roll on next weekend! You maybe had a trial of a day shopping for ingredients, yet still I maintain that as the Verve would say you are a ‘lucky man’. And as Kylie would say ‘I should be so lucky’ etc etc. 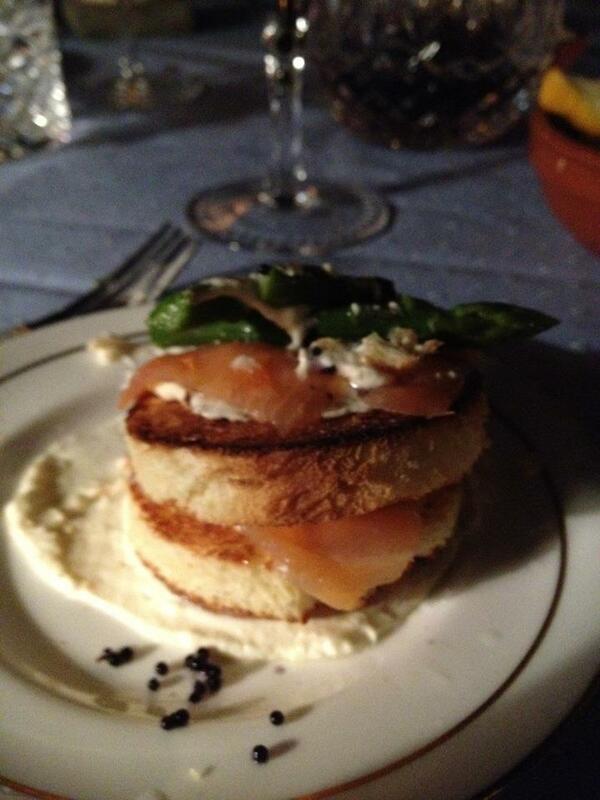 Fab dining! Sure was Hatstand. Epic feast! Good song selections! Sounds delightful. I particularly like the first course! Recipe please? 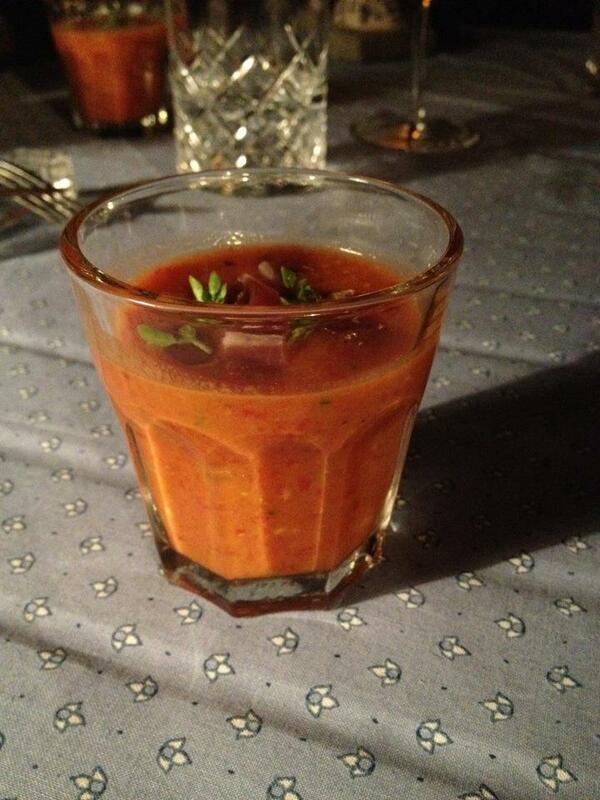 1/2 tblesp coarsely ground black pepper, 1 tblesp worcestershire sauce, 1 tblesp sesame oil. Slice the beef against the grain into 3mm slices and place in a non metallic shallow dish. Mix all remaining ingredients together to make a marinade. Cover the beef with the mixture, cover and leave to marinate for at least 2 hours but no more than 12. Sandy – i’m sure that Jenny didn’t ‘throw the stuff together to feed some friends’ ! she took the ingredients and with love, care and expertise created delectable delights to make the evening both enjoyable and memorable. I feel the same way about shopping. The only food shop I go into is the farm shop, otherwise everything gets delivered. Very sensible Lesley! Love farm shops!